News - Thin Plates Lifting using Permanent Lifting Magnets - Armstrong Magnetics, Inc. If you are planning to buy a permanent lifting magnet to lift a thin plate of ¼” or thinner, the rated lifting capacity of the lifting magnet which you intent to order should not be the most important consideration. You may know that the thinner the plate, the weaker the holding force of the lifting magnet. The reason is that a thin plate, as a part of the magnetic circuit together with the permanent lifting magnet, is easily saturated resulting that the total flux from the lifting magnet becomes fewer and even worse a portion of the magnetic flux go through the air bypass. The consequence is a weak lifting capacity for the thin plate. If the plate to be lifted is 6’ x 6’ x ¼”, for example, its weight is 378 lb only. NL-1320B (Rated lifting capacity 1,320 lb) cannot be used, its handle is hard to be rotated because the plate is too thin for the NL-1320B. You cannot use NL-660B (Rated lifting capacity 660 lb) too because NL-660B has 200 lb lifting capacity only for the plate (In fact, NL-660B can lift it but not safe). For this plate, PL-550 (Rated capacity 550 lb) could be right choice. Why is there such a result? 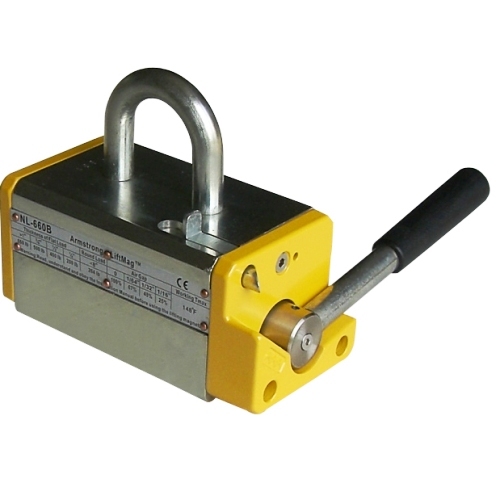 NL-B series lifting magnets have two poles which have relatively large area. The large poles can make the thin plate saturated and only a small amount of flux can flow through the thin plate resulting in a weak holding force of the lifting magnet to it. However, PL-550 has quite a few poles which are long and narrow. Flux from these poles might not saturate the thin plate and short distances between every two poles make smaller magnetic resistance. Therefore, the total flux through the plate should be much more than that of NL-660B and eventually its lifting force should be much more than that of NL-660B for the thin plate. Besides a thin plate can only accept a small amount of magnetic flux, there would be bending of the thin plate due to overhang Stretched out from the poles of lifting magnet. The weight of unsupported overhang portion of the plate could peel th e large plate off the poles of the lifting magnet. In such situation, you have to consider two or more lifting magnets with a spreader beam to handle a large, thin plate. Armstrong Magnetics always discuss with new customers about the loads to be lifted before shipping lifting magnets to help select right modes. Apart from permanent lifting magnets for handling thin plate, electro permanent lifting magnets or lifting system would be another good choice. Our new product, the modules of EPBS-MS Battery Activated Lifting Magnets, is specially designed for lifting thin plate.